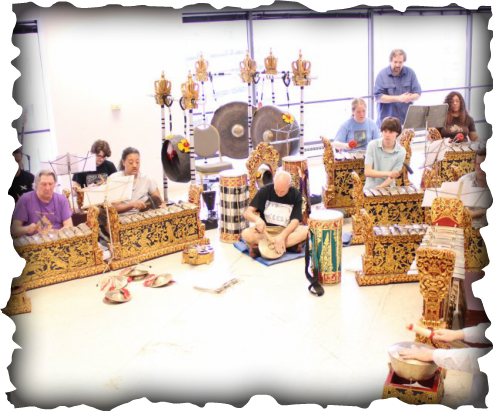 Gamelan Genta Kasturi, a community Balinese Semaradana Gamelan ensemble, has existed since its creation in the spring of 2003 by Balinese master musician I Ketút Gedé Asnawa and family in partnership with the University of Missouri, Kansas City. Since Mr. Asnawa's departure for a position at University of Illinois Urbana-Champaign - Center for World Music in the spring of 2006, the group has continued to retain repertoire taught to us by him, perform regularly and create/perform new work within the medium in collaboration with other musicians and choreographers. The groups intention is to continue in this vein; keeping repertoire taught to us up to speed, learning new traditional repertoire and creating our own original work in collaboration with other musicians, dancers and visual artists. We also retain the relationship with the Asnawa family, having performed together in Chicago as part of the 9th & 11th Annual Ramayana Festivals in 2009 and 2011 and specially produced annual concerts in Kansas City in 2009 & from 2014 to the present. Gamelan Genta Kasturi performing Sun Ra's Angels And Demons At Play at Never Records Kansas City from ted riederer on Vimeo.